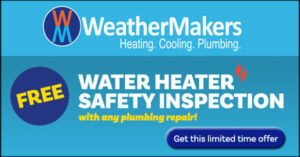 Receive a free water heater inspection with any WeatherMakers plumbing repair. This is a limited time offer, so contact us today for details. It’s our 63rd birthday, and we’d like to share the joy. 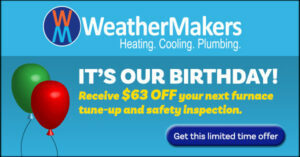 Receive $63 off your next furnace tune-up and safety inspection with WeatherMakers. Simply contact us and mention this coupon. We’re proud to be one of Edmonton-and-area’s longest-serving HVAC and plumbing contractors. 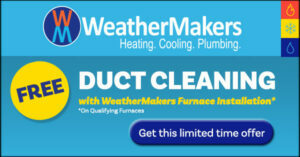 Receive free duct cleaning when WeatherMakers installs your next furnace. This deal is on select furnace purchases, so check with us about this limited time offer. Save over $450! Now is the time to buy. 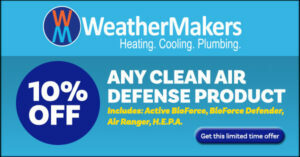 Receive 10% off any clean air defense product when you purchase Active BioForce, BioForce Defender, Air Ranger, or H.E.P.A. brand products from WeatherMakers. Get in touch today to make use of this limited time offer. Did you know you can increase your at-home energy efficiency with improved insulation, upgraded windows, and installation of tankless water heaters—all at a great discount, thanks to a provincial rebate program. Partnering with Energy Efficient Alberta has given WeatherMakers access to discounts and rebates on new tankless water heater installations. Tankless water heaters are more energy efficient than traditional tank units, improving the overall energy-efficiency of your home. Tankless hot water systems take up less space, waste less energy and may even provide hot water faster than conventional systems. Domestic hot water upgrades to ENERGY STAR® tankless systems present a tremendous energy-saving opportunity over older storage tank systems, especially those equipped with standing pilot lights. Rebates of up to $1,000 are available for the installation of a new tankless hot water heater. The following examples provide minimum estimates of how much money you can expect to get back in rebates—call today for more details. To raise awareness among energy consumers of energy use and the associated economic and environmental consequences. To promote, design and deliver programs and carry out other activities related to energy efficiency, energy conservation and the development of micro-generation and small-scale energy systems in Alberta. To promote the development of an energy efficiency services industry.